SIV is a Portable System Information Tool that can be used to view hardware and software information related to the system it is being run from. 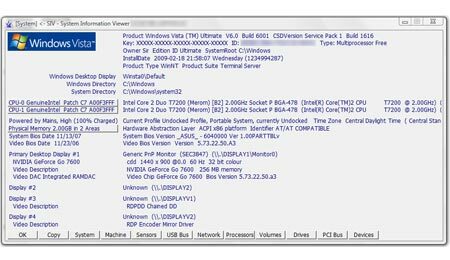 For example, SIV could be used to display Windows info, Network info, Hardware device info, CPU info, PCMCIA info, PCI info, USB info, Hardware Sensors, Machine Info, Operating System Information and much more. Best of all, this System Information Tool can be carried with you on a portable USB device.